Definition at line 69 of file lldrawable.h. Definition at line 219 of file lldrawable.h. Definition at line 220 of file lldrawable.h. Definition at line 217 of file lldrawable.h. Definition at line 218 of file lldrawable.h. Definition at line 306 of file lldrawable.h. Definition at line 247 of file lldrawable.h. Definition at line 74 of file lldrawable.h. Definition at line 206 of file lldrawable.h. Definition at line 298 of file lldrawable.cpp. References face, LLFace::FULLBRIGHT, LLPipeline::getPoolTypeFromTE(), gPipeline, isState(), mFaces, LLMemType::MTYPE_DRAWABLE, mVObjp, and UNLIT. Definition at line 274 of file lldrawable.cpp. References face, LLFace::FULLBRIGHT, isState(), llendl, llerrs, mFaces, LLMemType::MTYPE_DRAWABLE, mVObjp, and UNLIT. Referenced by setNumFaces(), setNumFacesFast(), LLVOWater::updateGeometry(), LLVOSky::updateGeometry(), and LLVOGround::updateGeometry(). Definition at line 992 of file lldrawable.cpp. References f, gCamera, getPositionAgent(), LLSky::getTotalAmbientColor(), LLCoordFrame::getXAxis(), gPipeline, gSky, light, llmax(), mLightSet, LLPipeline::mSunDiffuse, LLPipeline::mSunDir, LLMemType::MTYPE_DRAWABLE, and LLColor4::mV. Definition at line 118 of file lldrawable.h. Definition at line 223 of file lldrawable.cpp. References LLDynamicArray< Type, BlockSize >::reset(), and sDeadList. Definition at line 203 of file lldrawable.cpp. References clearLightSet(), LLFastTimer::FTM_PIPELINE, gObjectList, gPipeline, mBlockSet, mFaces, mParent, mVObjp, NULL, LLViewerObjectList::removeDrawable(), t, and LLPipeline::unlinkDrawable(). Referenced by LLSpatialBridge::cleanupReferences(), and markDead(). Definition at line 188 of file lldrawable.cpp. References gPipeline, LLPipeline::markRelight(), and mLightSet. Definition at line 112 of file lldrawable.h. Referenced by LLPipeline::calcNearbyLights(), LLVolumeImplFlexible::doUpdateGeometry(), makeActive(), makeStatic(), LLPipeline::markMoved(), LLPipeline::markRebuild(), LLPipeline::setLight(), setLit(), LLPipeline::stateSort(), LLPipeline::updateGeom(), updateGeometry(), LLPipeline::updateMoveDampedAsync(), and LLPipeline::updateMovedList(). Definition at line 374 of file lldrawable.cpp. Definition at line 123 of file lldrawable.cpp. References isDead(), mFaces, and sNumZombieDrawables. Definition at line 239 of file lldrawable.cpp. References count, llendl, llinfos, mBlockSet, mLightSet, mParent, and S32. Definition at line 105 of file lldrawable.h. Definition at line 854 of file lldrawable.cpp. References LLXformMatrix::getMinMax(), LLXform::getPositionW(), and mXform. Definition at line 120 of file lldrawable.h. Referenced by LLSpatialBridge::cleanupReferences(), makeActive(), LLPipeline::renderForSelect(), and LLSpatialBridge::updateDistance(). Definition at line 121 of file lldrawable.h. Definition at line 298 of file lldrawable.h. Referenced by LLSpatialGroup::changeLOD(), LLVolumeImplFlexible::doIdleUpdate(), LLDrawPoolWater::render(), LLVOAvatar::updateCharacter(), and LLViewerPartSim::updateSimulation(). Definition at line 333 of file lldrawable.h. Referenced by LLVOClouds::getGeometry(), moveUpdatePipeline(), LLViewerObjectList::removeDrawable(), renderBoundingBox(), LLPipeline::renderForSelect(), renderParticleBeacons(), renderPhysicalBeacons(), renderPoints(), renderScriptedBeacons(), renderScriptedTouchBeacons(), renderTexturePriority(), LLPipeline::resetVertexBuffers(), LLViewerJointAttachment::setupDrawable(), shiftPos(), LLAgent::updateCamera(), updateDistance(), LLVOWater::updateGeometry(), LLVOTree::updateGeometry(), LLVOTextBubble::updateGeometry(), LLVOPartGroup::updateGeometry(), LLVOGround::updateGeometry(), and LLVOClouds::updateGeometry(). Definition at line 168 of file lldrawable.h. Definition at line 103 of file lldrawable.h. References LLXform::getScale(), llmin(), LLVector3::mV, and mXform. Definition at line 170 of file lldrawable.h. References FALSE, isState(), TRUE, and UNLIT. Referenced by LLPipeline::markRebuild(), and updateLighting(). Definition at line 104 of file lldrawable.h. Definition at line 106 of file lldrawable.h. Definition at line 341 of file lldrawable.h. Referenced by moveUpdatePipeline(), LLViewerObjectList::removeDrawable(), renderBoundingBox(), LLPipeline::renderForSelect(), renderParticleBeacons(), renderPhysicalBeacons(), renderPoints(), renderScriptedBeacons(), renderScriptedTouchBeacons(), renderTexturePriority(), LLPipeline::resetVertexBuffers(), LLViewerJointAttachment::setupDrawable(), shiftPos(), LLPipeline::stateSort(), LLAgent::updateCamera(), updateDistance(), LLVOWater::updateGeometry(), LLVOTextBubble::updateGeometry(), LLVOPartGroup::updateGeometry(), LLVOGround::updateGeometry(), LLVOClouds::updateGeometry(), and updateTexture(). Definition at line 119 of file lldrawable.h. Referenced by getPositionAgent(), getRenderMatrix(), getSpatialPartition(), isVisible(), makeActive(), LLPipeline::markMoved(), LLPipeline::markShift(), LLSpatialBridge::setVisible(), LLPipeline::updateGeom(), LLPipeline::updateMove(), and updateTexture(). Definition at line 96 of file lldrawable.h. Definition at line 1447 of file lldrawable.cpp. References getParent(), getVOVolume(), getWorldMatrix(), getWorldPosition(), isActive(), isRoot(), and mVObjp. Referenced by applyLightsAsPoint(), LLToolSelectRect::handleRectangleSelection(), LLViewerWindow::renderSelections(), LLVOSky::updateGeometry(), and updateLightSet(). Definition at line 99 of file lldrawable.h. Referenced by LLSpatialPartition::put(), renderPoints(), updateDistance(), and LLSpatialGroup::updateInGroup(). Definition at line 177 of file lldrawable.h. Referenced by LLSpatialGroup::addObject(), getVisibilityRadius(), LLToolSelectRect::handleRectangleSelection(), updateBinRadius(), and updateLightSet(). Definition at line 87 of file lldrawable.h. Definition at line 94 of file lldrawable.h. References getParent(), getWorldMatrix(), and isRoot(). Referenced by LLDrawPoolAlpha::renderAlpha(), and LLDrawPoolAlpha::renderAlphaHighlight(). Definition at line 192 of file lldrawable.h. Referenced by LLPipeline::renderForSelect(), and LLPipeline::stateSort(). Definition at line 102 of file lldrawable.h. Definition at line 100 of file lldrawable.h. Definition at line 301 of file lldrawable.h. Definition at line 860 of file lldrawable.cpp. Referenced by LLSpatialGroup::boundObjects(), LLSelectMgr::getGrid(), and renderBoundingBox(). Definition at line 198 of file lldrawable.h. Referenced by isVisible(), movePartition(), updateDistance(), LLPipeline::updateGeom(), LLVOPartGroup::updateGeometry(), LLSpatialBridge::updateMove(), and LLSpatialBridge::~LLSpatialBridge(). Definition at line 1060 of file lldrawable.cpp. References getParent(), getSpatialPartition(), LLPipeline::getSpatialPartition(), getVOVolume(), gPipeline, isRoot(), isStatic(), mSpatialBridge, mVObjp, LLPointer< Type >::notNull(), NULL, and setSpatialBridge(). Referenced by getSpatialPartition(), and movePartition(). Definition at line 109 of file lldrawable.h. Definition at line 161 of file lldrawable.h. Definition at line 88 of file lldrawable.h. Definition at line 1031 of file lldrawable.cpp. References getRadius(), getVOVolume(), isDead(), isLight(), and llmax(). Definition at line 90 of file lldrawable.h. Definition at line 89 of file lldrawable.h. Referenced by addParticleSourcesToList(), addSourcesToEventLog(), LLOctreePick::check(), isAnimating(), LLPipeline::markRebuild(), LLPipeline::markShift(), LLPipeline::pickObject(), LLSpatialPartition::put(), LLDrawPoolAvatar::renderAvatars(), renderBoundingBox(), LLDrawPoolAvatar::renderForSelect(), LLDrawPoolTerrain::renderOwnership(), renderParticleBeacons(), renderPhysicalBeacons(), renderScriptedBeacons(), renderScriptedTouchBeacons(), LLDrawPoolTree::renderTree(), LLSpatialBridge::setVisible(), LLOctreeGet::skip(), and LLPipeline::stateSort(). Definition at line 162 of file lldrawable.cpp. References LLPrimitive::getPCode(), isDead(), LL_PCODE_VOLUME, mVObjp, and NULL. Referenced by LLPipeline::calcNearbyLights(), getPositionAgent(), getSpatialPartition(), getVisibilityRadius(), isAnimating(), LLManip::rebuild(), LLVolumeGeometryManager::rebuildGeom(), renderBoundingBox(), LLViewerWindow::renderSelections(), setVisible(), updateDistance(), updateLightSet(), updatePartition(), and updateTexture(). Definition at line 93 of file lldrawable.h. Referenced by getPositionAgent(), and getRenderMatrix(). Definition at line 97 of file lldrawable.h. Definition at line 101 of file lldrawable.h. Definition at line 107 of file lldrawable.h. Referenced by LLSpatialBridge::transformCamera(), and LLSpatialBridge::updateSpatialExtents(). Definition at line 85 of file lldrawable.cpp. References gCamera, LLCamera::getView(), LLViewerWindow::getWindowDisplayHeight(), gViewerWindow, sCurPixelAngle, and sCurVisible. Definition at line 90 of file lldrawable.cpp. References mBinRadius, mCurrentScale, mDistanceWRTCamera, mGeneration, mParent, mQuietCount, mRadius, mRenderType, mSpatialBridge, mSpatialGroupp, mState, mSunShadowFactor, mUVZ, mVisible, mVObjp, and NULL. Definition at line 118 of file lldrawable.cpp. Definition at line 146 of file lldrawable.h. Referenced by LLViewerCamera::areVertsVisible(), LLSelectMgr::getGrid(), getPositionAgent(), isStatic(), isVisible(), LLSelectNode::renderOneSilhouette(), LLViewerObject::setDrawableParent(), setVisible(), LLPipeline::stateSort(), LLPipeline::updateMove(), LLVOVolume::updateRelativeXform(), and updateTexture(). Definition at line 1473 of file lldrawable.cpp. References FALSE, getScale(), getVObj(), getVOVolume(), isRoot(), LLViewerObject::LL_VO_CLOUDS, LLViewerObject::LL_VO_PART_GROUP, LLVOVolume::mTextureAnimp, mVObjp, and TRUE. Definition at line 114 of file lldrawable.h. Definition at line 78 of file lldrawable.h. Referenced by destroy(), getVisibilityRadius(), getVOVolume(), isLight(), markDead(), LLPipeline::markMoved(), LLPipeline::markRebuild(), LLPipeline::markShift(), LLPipeline::markTextured(), LLPipeline::markVisible(), LLPipeline::renderForSelect(), LLDrawPoolTree::renderTree(), shiftPos(), LLPipeline::stateSort(), LLPipeline::updateGeom(), updateLightSet(), LLPipeline::updateMove(), updateMove(), LLPipeline::updateMovedList(), and updateTexture(). Definition at line 175 of file lldrawable.cpp. References FALSE, LLPrimitive::getPCode(), isDead(), LL_PCODE_VOLUME, and mVObjp. Referenced by getVisibilityRadius(), LLPipeline::markRebuild(), moveUpdatePipeline(), LLViewerWindow::renderSelections(), LLOctreeGet::skip(), updateLighting(), and updateLightSet(). Definition at line 79 of file lldrawable.h. Definition at line 191 of file lldrawable.h. Definition at line 115 of file lldrawable.h. Referenced by getPositionAgent(), getRenderMatrix(), getSpatialPartition(), isAnimating(), isVisible(), makeActive(), renderBoundingBox(), setVisible(), LLPipeline::updateGeom(), LLPipeline::updateMove(), and updateTexture(). Definition at line 117 of file lldrawable.h. Referenced by LLSpatialGroup::addObject(), LLPipeline::markMoved(), LLPipeline::markVisible(), LLSpatialGroup::removeObject(), and renderBoundingBox(). Definition at line 116 of file lldrawable.h. Definition at line 110 of file lldrawable.h. Referenced by addFace(), LLPipeline::calcNearbyLights(), LLSelectMgr::dump(), getLit(), isActive(), isDead(), isNew(), makeActive(), makeStatic(), LLPipeline::markMoved(), LLPipeline::markRebuild(), LLPipeline::markShift(), moveUpdatePipeline(), LLOctreeGet::skip(), LLPipeline::stateSort(), LLPipeline::updateGeom(), updateGeometry(), updateMove(), updateMoveDamped(), LLPipeline::updateMoveDampedAsync(), LLPipeline::updateMovedList(), LLPipeline::updateMoveNormalAsync(), and updateMoveUndamped(). Definition at line 147 of file lldrawable.h. Referenced by getSpatialPartition(), setVisible(), and shiftPos(). Definition at line 1100 of file lldrawable.cpp. References FALSE, getParent(), getSpatialGroup(), isActive(), isRoot(), LLSpatialGroup::isVisible(), mSpatialBridge, mVisible, LLPointer< Type >::notNull(), sCurVisible, and TRUE. Referenced by LLSelectMgr::dump(), LLDrawable::CompareDistanceGreaterVisibleFirst::operator()(), and LLPipeline::stateSort(). Definition at line 392 of file lldrawable.cpp. References ACTIVE, clearState(), getChild(), getChildCount(), getParent(), gPipeline, isRoot(), isState(), LIGHTING_BUILT, LL_PCODE_PATH_FLEXIBLE, LL_PCODE_VOLUME, LLViewerObject::LL_VO_CLOUDS, LLViewerObject::LL_VO_GROUND, LLViewerObject::LL_VO_PART_GROUP, LLViewerObject::LL_VO_SKY, LLViewerObject::LL_VO_STARS, LLViewerObject::LL_VO_SURFACE_PATCH, LLViewerObject::LL_VO_WATER, llendl, llerrs, makeActive(), LLPipeline::markRebuild(), mParent, mQuietCount, mVObjp, LLPointer< Type >::notNull(), REBUILD_VOLUME, LLPipeline::setActive(), setState(), TRUE, and updatePartition(). Referenced by makeActive(), moveUpdatePipeline(), LLViewerJointAttachment::setupDrawable(), and updateMove(). Definition at line 459 of file lldrawable.cpp. References ACTIVE, clearState(), FALSE, gPipeline, isState(), LL_PCODE_VOLUME, llendl, llwarns, LLPipeline::markRebuild(), LLPipeline::markRelight(), mParent, mSpatialBridge, mVObjp, LLPointer< Type >::notNull(), NULL, REBUILD_VOLUME, S32, LLPipeline::setActive(), setSpatialBridge(), TRUE, and updatePartition(). Definition at line 140 of file lldrawable.cpp. References cleanupReferences(), DEAD, isDead(), llendl, llwarns, mSpatialBridge, NULL, setState(), and sNumZombieDrawables. Definition at line 360 of file lldrawable.cpp. Definition at line 608 of file lldrawable.cpp. References getSpatialGroup(), getSpatialPartition(), and LLSpatialPartition::move(). Referenced by LLVOPartGroup::updateGeometry(), LLVOClouds::updateGeometry(), and updatePartition(). Definition at line 585 of file lldrawable.cpp. References BUILT, f, getFace(), getNumFaces(), LLXform::getPositionW(), gPipeline, isLight(), isState(), LLVector3::magVecSquared(), makeActive(), LLPipeline::markRelight(), mSavePos, mXform, S32, and LLFace::updateCenterAgent(). Referenced by updateMoveDamped(), and updateMoveUndamped(). Definition at line 171 of file lldrawable.h. References clearState(), setState(), and UNLIT. Definition at line 318 of file lldrawable.cpp. References addFace(), mFaces, and S32. Referenced by LLVOTextBubble::updateGeometry(), and LLVOPartGroup::updateGeometry(). Definition at line 339 of file lldrawable.cpp. Definition at line 95 of file lldrawable.h. Definition at line 188 of file lldrawable.h. Definition at line 872 of file lldrawable.cpp. Definition at line 577 of file lldrawable.cpp. Definition at line 190 of file lldrawable.h. Definition at line 300 of file lldrawable.h. Referenced by LLSpatialBridge::cleanupReferences(), getSpatialPartition(), LLSpatialBridge::LLSpatialBridge(), and makeStatic(). Definition at line 865 of file lldrawable.cpp. Definition at line 1051 of file lldrawable.cpp. References LLSpatialGroup::GEOM_DIRTY, mSpatialGroupp, and LLSpatialGroup::setState(). Referenced by LLSpatialGroup::addObject(), LLSpatialBridge::cleanupReferences(), LLSpatialPartition::remove(), and LLSpatialGroup::removeObject(). Definition at line 111 of file lldrawable.h. Referenced by LLPipeline::allocDrawable(), makeActive(), markDead(), LLPipeline::markMoved(), LLPipeline::markRebuild(), LLPipeline::markShift(), LLManip::rebuild(), setLit(), LLViewerJointAttachment::setupDrawable(), LLPipeline::updateDrawableGeom(), LLVOVolume::updateGeometry(), updateLighting(), LLPipeline::updateMoveDampedAsync(), and LLPipeline::updateMoveNormalAsync(). Definition at line 162 of file lldrawable.h. Definition at line 1258 of file lldrawable.cpp. References getVOVolume(), isActive(), isRoot(), isStatic(), llendl, llerrs, mParent, mSpatialBridge, mVisible, LLPointer< Type >::notNull(), and sCurVisible. Referenced by LLPipeline::markVisible(), LLSpatialBridge::setVisible(), and LLPipeline::stateSort(). Reimplemented in LLSpatialBridge, and LLHUDBridge. Definition at line 801 of file lldrawable.cpp. References getFace(), getNumFaces(), LLXform::getPositionW(), gPipeline, isDead(), isStatic(), llendl, llwarns, LLPipeline::markRebuild(), LLFace::mCenterAgent, mExtents, mParent, mPositionGroup, mSavePos, mSpatialBridge, mVObjp, mXform, NULL, REBUILD_GEOMETRY, S32, LLXform::setPosition(), LLXform::setRotation(), LLXform::setScale(), TRUE, and LLXformMatrix::updateMatrix(). Definition at line 382 of file lldrawable.cpp. Definition at line 893 of file lldrawable.cpp. References getRadius(), mBinRadius, mVObjp, and LLPointer< Type >::notNull(). Definition at line 703 of file lldrawable.cpp. References LLSpatialGroup::changeLOD(), LLCoordFrame::getAtAxis(), getFace(), getNumFaces(), LLCoordFrame::getOrigin(), getPositionGroup(), getSpatialGroup(), getVOVolume(), j, llround(), LLVector3::magVec(), mDistanceWRTCamera, LLVector3::mV, mVObjp, LLDrawPool::POOL_ALPHA, S32, LLVOVolume::updateRelativeXform(), and v.
Referenced by LLPipeline::stateSort(), and LLSpatialBridge::updateDistance(). Definition at line 1514 of file lldrawable.cpp. Definition at line 782 of file lldrawable.cpp. References clearState(), FALSE, gPipeline, isState(), llassert, LLPipeline::markRelight(), mVObjp, LLPointer< Type >::notNull(), REBUILD_LIGHTING, TRUE, and updateLighting(). Definition at line 965 of file lldrawable.cpp. 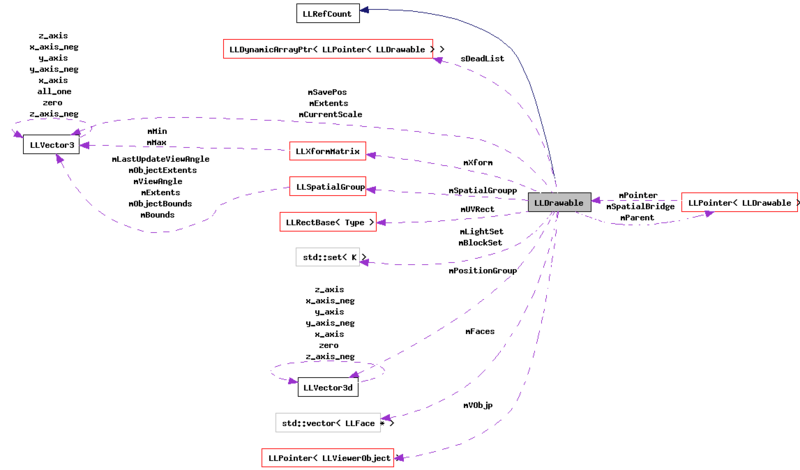 References FALSE, LLFastTimer::FTM_GEO_LIGHT, LLFastTimer::FTM_UPDATE_LIGHTS, LLPipeline::getLightingDetail(), getLit(), gPipeline, isLight(), LIGHTING_BUILT, mVObjp, setState(), t, TRUE, and updateLightSet(). Definition at line 905 of file lldrawable.cpp. References count, LLSpatialPartition::getLights(), LLSpatialPartition::getObjects(), getPositionAgent(), getRadius(), LLPipeline::getSpatialPartition(), getVOVolume(), gPipeline, isDead(), isLight(), light, llendl, llwarns, LLVector3::magVecSquared(), LLPipeline::markRelight(), mLightSet, LLPipeline::PARTITION_VOLUME, and S32. Definition at line 388 of file lldrawable.cpp. Definition at line 617 of file lldrawable.cpp. References FALSE, isDead(), LLPointer< Type >::isNull(), isState(), llendl, llwarns, makeActive(), MOVE_UNDAMPED, mVObjp, TRUE, updateMoveDamped(), and updateMoveUndamped(). Referenced by LLManip::rebuild(), LLPipeline::updateMoveDampedAsync(), LLPipeline::updateMovedList(), and LLPipeline::updateMoveNormalAsync(). Definition at line 680 of file lldrawable.cpp. References FALSE, INVISIBLE, isState(), mGeneration, LLXform::MOVED, moveUpdatePipeline(), mVObjp, TRUE, and updateXform(). Definition at line 645 of file lldrawable.cpp. References INVISIBLE, isState(), mGeneration, LLXform::MOVED, moveUpdatePipeline(), mVObjp, TRUE, and updateXform(). Definition at line 663 of file lldrawable.cpp. References FALSE, getVOVolume(), gPipeline, LLPipeline::markMoved(), LLPipeline::markRebuild(), movePartition(), mSpatialBridge, REBUILD_POSITION, and TRUE. Referenced by makeActive(), and makeStatic(). Definition at line 877 of file lldrawable.cpp. References mExtents, mPositionGroup, mSpatialBridge, mVObjp, LLPointer< Type >::notNull(), LLVector3d::setVec(), and updateBinRadius(). Referenced by LLSpatialPartition::put(), and LLSpatialGroup::updateInGroup(). Definition at line 958 of file lldrawable.cpp. Definition at line 745 of file lldrawable.cpp. References getNumFaces(), getParent(), getVOVolume(), gPipeline, isActive(), isDead(), isRoot(), llendl, llwarns, LLPipeline::markMoved(), LLPipeline::markRebuild(), mQuietCount, LLMemType::MTYPE_DRAWABLE, mVObjp, REBUILD_MATERIAL, and TRUE. Definition at line 1047 of file lldrawable.cpp. Definition at line 501 of file lldrawable.cpp. References dist_vec_squared(), dot(), f, LLCriticalDamp::getInterpolant(), LLXform::getPosition(), LLXform::getRotation(), gPipeline, LLXform::isRoot(), lerp(), llclamp(), LLPipeline::markRebuild(), MAX_INTERPOLATE_DISTANCE_SQUARED, mCurrentScale, mDistanceWRTCamera, MIN_INTERPOLATE_DISTANCE_SQUARED, mVObjp, mXform, nlerp(), OBJECT_DAMPING_TIME_CONSTANT, REBUILD_POSITION, LLXform::setPosition(), LLXform::setRotation(), LLXform::setScale(), TRUE, and LLXformMatrix::updateMatrix(). Referenced by LLPipeline::allocDrawable(), updateMoveDamped(), and updateMoveUndamped(). Definition at line 214 of file lldrawable.h. Definition at line 213 of file lldrawable.h. Definition at line 215 of file lldrawable.h. Definition at line 319 of file lldrawable.h. Referenced by getBinRadius(), init(), LLSpatialBridge::updateBinRadius(), and updateBinRadius(). Definition at line 293 of file lldrawable.h. Referenced by cleanupReferences(), and findReferences(). Definition at line 324 of file lldrawable.h. Referenced by getScale(), init(), and updateXform(). Definition at line 287 of file lldrawable.h. Referenced by init(), LLDrawable::CompareDistanceGreaterVisibleFirst::operator()(), LLDrawable::CompareDistanceGreater::operator()(), updateDistance(), and updateXform(). Definition at line 317 of file lldrawable.h. Referenced by getSpatialExtents(), setSpatialExtents(), LLSpatialBridge::setVisible(), LLSpatialBridge::shiftPos(), shiftPos(), LLSpatialBridge::updateSpatialExtents(), and updateSpatialExtents(). Definition at line 311 of file lldrawable.h. Referenced by addFace(), cleanupReferences(), deleteFaces(), destroy(), getFace(), getNumFaces(), mergeFaces(), setNumFaces(), setNumFacesFast(), and LLPipeline::stateSort(). Definition at line 320 of file lldrawable.h. Referenced by getGeneration(), init(), updateMoveDamped(), and updateMoveUndamped(). Definition at line 292 of file lldrawable.h. Referenced by applyLightsAsPoint(), clearLightSet(), findReferences(), and updateLightSet(). Definition at line 285 of file lldrawable.h. Referenced by cleanupReferences(), findReferences(), getParent(), init(), isRoot(), isSpatialRoot(), makeActive(), makeStatic(), setVisible(), and shiftPos(). Definition at line 318 of file lldrawable.h. Referenced by getPositionGroup(), setPositionGroup(), LLSpatialBridge::shiftPos(), shiftPos(), and updateSpatialExtents(). Definition at line 296 of file lldrawable.h. Referenced by init(), makeActive(), LLPipeline::updateMove(), and updateTexture(). Definition at line 316 of file lldrawable.h. Referenced by getRadius(), init(), and setRadius(). Definition at line 309 of file lldrawable.h. Referenced by getRenderType(), init(), isRenderType(), LLSpatialBridge::LLSpatialBridge(), setRenderType(), and LLPipeline::stateSort(). Definition at line 295 of file lldrawable.h. Referenced by moveUpdatePipeline(), and shiftPos(). Definition at line 313 of file lldrawable.h. Referenced by getSpatialBridge(), getSpatialPartition(), init(), isVisible(), makeStatic(), markDead(), setSpatialBridge(), setVisible(), shiftPos(), updatePartition(), and updateSpatialExtents(). Definition at line 312 of file lldrawable.h. Referenced by getSpatialGroup(), init(), and setSpatialGroup(). Definition at line 308 of file lldrawable.h. Definition at line 322 of file lldrawable.h. Referenced by getSunShadowFactor(), init(), and setSunShadowFactor(). Definition at line 289 of file lldrawable.h. Definition at line 290 of file lldrawable.h. Definition at line 315 of file lldrawable.h. Referenced by init(), isVisible(), and setVisible(). Definition at line 310 of file lldrawable.h. Referenced by addFace(), LLPipeline::allocDrawable(), cleanupReferences(), getChild(), getChildCount(), getLOD(), getPositionAgent(), getRegion(), getSpatialPartition(), getTextureEntry(), getVObj(), getVOVolume(), init(), isAnimating(), isAvatar(), isLight(), makeActive(), makeStatic(), shiftPos(), updateBinRadius(), updateDistance(), updateFaceSize(), updateGeometry(), updateLighting(), updateMove(), updateMoveDamped(), updateMoveUndamped(), updateSpatialExtents(), updateTexture(), and updateXform(). Definition at line 282 of file lldrawable.h. Referenced by getBounds(), getIntensity(), getMinMax(), getPosition(), getRotation(), getWorldMatrix(), getWorldPosition(), getWorldRotation(), getXform(), moveUpdatePipeline(), LLFace::setDrawable(), LLViewerObject::setDrawableParent(), LLViewerJointAttachment::setupDrawable(), shiftPos(), and updateXform(). Definition at line 303 of file lldrawable.h. Referenced by LLPipeline::calcPixelArea(), and incrementVisible(). Definition at line 326 of file lldrawable.h. Referenced by getCurrentFrame(), incrementVisible(), isVisible(), and setVisible(). Definition at line 329 of file lldrawable.h. Definition at line 328 of file lldrawable.h. Referenced by destroy(), and markDead().